The Urban with Stone Washed D2 tool steel blade from Russian knife maker Kizlyar Supreme features a lot of utility in a small fixed blade knife. The Urban’s wide, slightly hollow ground blade is a good compromise for slicing and general use tasks. The wide belly and slight drop point make for an exceptional field dress knife, cardboard slicer, apple peeler or whatever task is at hand. A slight thumb ramp gives precise point control for fine work. The handle features layered micarta scales that have been 3D sculpted for an incredibly comfortable grip. The handle scales are removable with a T-8 Torx bit however getting out the pressed tubular lanyard hole would be a chore. If cleaning under the scales is required they will readily swing around the lanyard tube once the two Torx screws are removed giving easy access to clean most of the blade tang. A molded pancake style kydex sheath is included that allows high, low and horizontal (or scout) carry options. Made by Kizlyar Supreme. 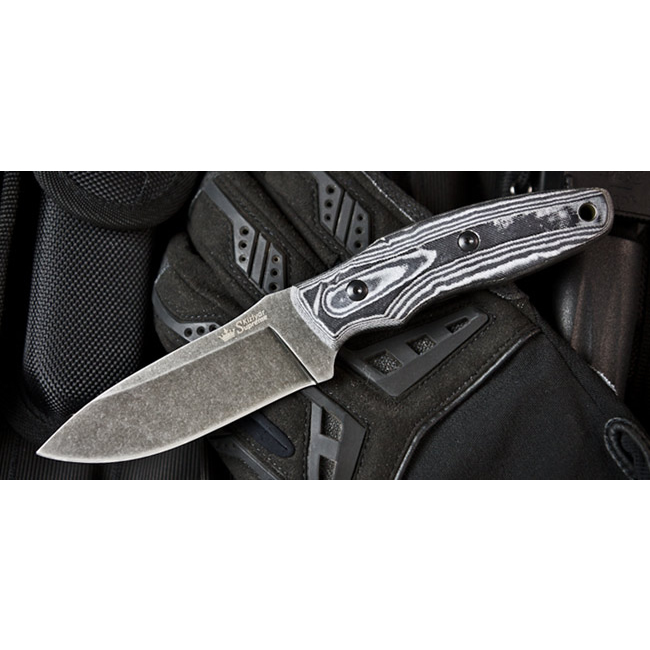 Key Features: Stone Washed D2 Steel Layered Micarta Grip Scales Multi-position Kydex Sheath Overall: 8″ Blade Length: 3 3/4″ Handle Length: 4 1/4″ Weight: 4 3/4 oz Width at Guard: 1 1/4″ Blade Steel: D2 Hrc Edge: 60-63 HRC Handle Material: Micarta Specs will vary slightly from piece to piece.